Donaire Hungry for a Win in a Featherweight Fury! 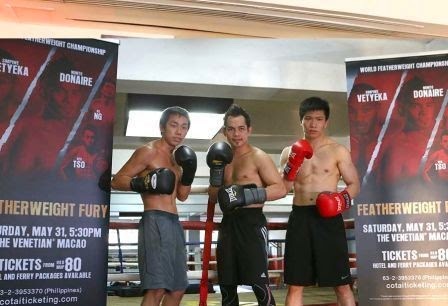 ABS-CBN will air Top Rank Promotion’s “Featherweight Fury” which will be held at the Cotai Arena of The Venetian Macao in a special telecast of the brawl between Nonito “The Filipino Flash” Donaire and the WBA Featherweight Champion Simpiwe Vetyeka on Sunday (June 1) at 10:15 AM. Donaire promised to bring the beauty of boxing to Macao in his battle against the South African champion who reportedly handpicked the Donaire to be his opponent. Veteran boxing analyst Atty. Ed Tolentino said in an interview on ABS-CBN Sports+Action's "The Score" that Vetyeka is a “hungry champion” and wants to beat a high-profile boxer like Donaire. However, Donaire is equally hungry to prove himself after losing the championship to Guillermo Rigondeaux and an underwhelming non-title fight against Vic Darchinyan. In an interview with TV Patrol two days before the fight, Donaire said he feels good and has had no problem trimming down to the weight limit. The “Featherweight Fury” will feature two other featherweight title fights between Nicholas “The Axe Man” Walters versus Vic “Raging Bull” Darchinyan, and Evgeny “The Mexican Russian” Gradovich versus Alexander Miskirtchian. Aquabest: "The Water of Tomorrow"
Angel Locsin - May 2014 Babe of the Month! Tom Rodriguez - May 2014 Hunk of the Month!